I love Chick-Fil-A chicken sandwiches! I don't know anyone who doesn't, except for my son and he's just crazy. I have several Chick-Fil-A copy-cat recipes pinned to my Pinterest recipe board, but I decided to make this one from The Food Nework. The recipe didn't appear that difficult when I read through it before I started cooking. Mix the ingredients, coat the chicken, and fry in hot oil. Pretty straight forward, right? Well, after making these sandwiches, my kitchen looked like a tornado had hit it, so clean up was quite a bit more than usuall. I certainly wouldn't make this on a weeknight after being at work all day. You're probably wondering if these are any good and worth the mess and cleanup. Well, they were a pretty close resemblance to the real thing. The sandwiches were tender and moist, but didn't have as much flavor as the restaurant sandwiches. I followed the directions for the seasonings, so I'm guessing you would need to add some really unhealthy amounts of sugar and salt to make them taste like the real thing. 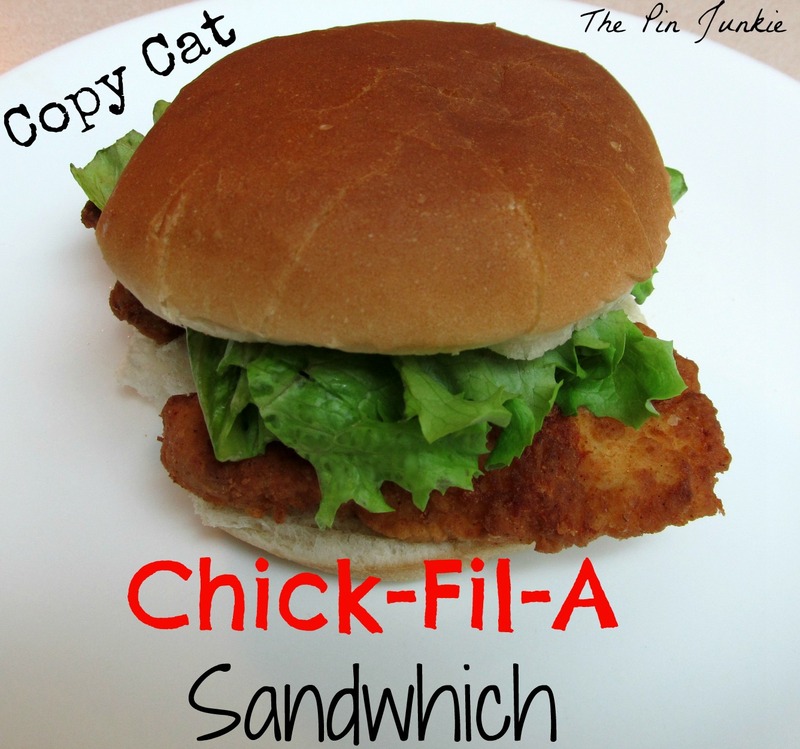 So if it's Sunday and you've got a craving for a Chick-Fil-A sandwich that just wont' quit - here's your recipe! Make sure you serve it to your family with a big smile and say "It's my pleasure to serve you!" for the full Chick-Fill-A experience! Um. Yes please!!! 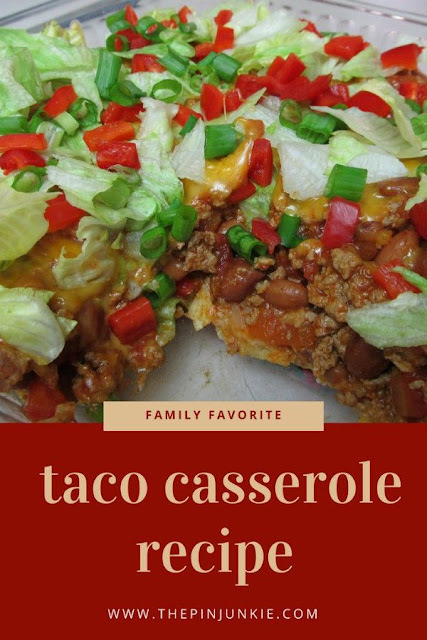 I just pinned this recipe and can't wait to try it. Thank you! Thanks for sharing! My family will LOVE this since we are missionaries in Asia and there is not a Chick-fil-a in sight:( Pinning this! Oh yeah!!! My favorite part of the entire sandwich are the pickles!! 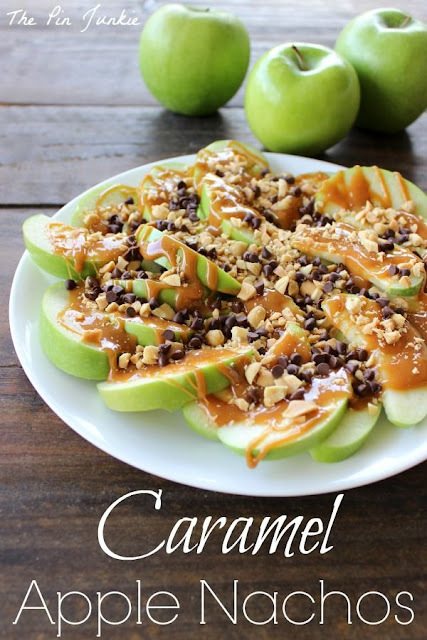 OMG, I need to make this! My girls & I love chick-fil-a! I would love for you to come and link this up on our linky party! Thanks for the invitation! I linked up and added your party to my "where I party" page. This looks yummy! Pinned it! Thanks for sharing at Titus 2 Tuesday. Just ate at CFA today... I'd love to be able to make a sandwich anytime I want. Thanks for the invitation! I linked up and added your party to my party page. I've got to pin this! Love Chick Fil A! Yummy! I am getting hungry.... Smells good too! I can smell it all the way over here in Idaho! I think breaded fried chicken is a lot of work, no matter the recipe, but it's always good. I'll have to try this recipe...I love Chik-fil-a chicken and I imagine this would be healthier. These look great! I'll have to try these. I love Chick-Fil-A sandwiches, but I don't like eating out that much. For someone who loves Chick-Fil-A, but lives literally hours away from the nearest location, I am definitely trying this!! Thanks for sharing. I have a weekly Link Up Party on Thursdays that just opened!! 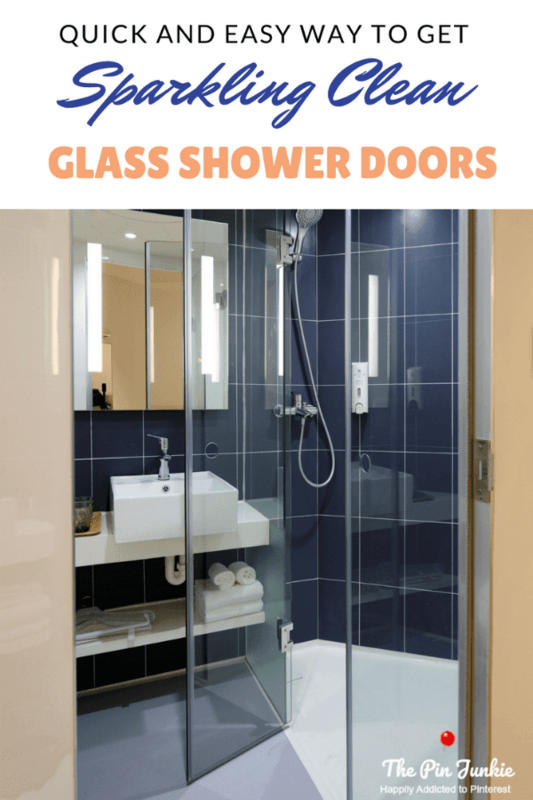 We share recipes, crafts, and other DIY tips and I'm sure our readers would love to see this post. Hope to see you there at allthingswithpurpose.com. And we are your newest like!! I am living overseas, and oh how I miss Chick-Fil-A sandwiches. Thank you for sharing! It looks delicious! My husband and I used to work for Chick-fil-a. I'll have to show him the recipe. We love Chik-Fil-A sandwiches. I'll definitely try this recipe! Visiting from Thursday's Fav Things @ Katherine's Corner. I am pinning this to make for my kiddos. They love their breakfast meals I think this with some homemade biscuits would be awesome. I'm such a Chick-Fil-A fan...and I love their chicken. We have moved to the northeast where there aren't any Chick-Fil-A's! Please consider linking this up at The Patriotic Pam this weekend. I have never heard of a Chik-Fil-A sandwich, but it looks really good. Love Chik-Fil-A!!! Thank you so much for sharing this on Foodie Friday. We don't have a chik-fil-a around here, so I'll be making some at home now. 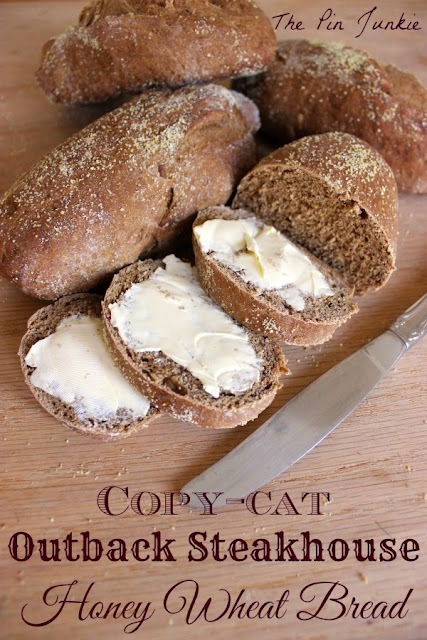 Thank you for sharing this recipe on Get Crafty Friday! Sadly I don't have a Chick-Fil-A in my area but now I can make my own! =) Have a great weekend! Yum, I love Chick-Fil-A! My fav! Thanks for sharing! What a nice surprise! Thanks so much for featuring my copy Chick-Fil-A sandwich! I rarely go to Chic-fil-a, but this looks yummy. Will be giving it a whirl! Thanks for sharing with SYC. I am pinning this. I would like to invite you to join Pin It Monday Hop Where you pin and get pinned(LINK). If you get a chance, I'd love for you to stop by and join us. I hope to see you soon. Thanks for the invitation Judy! I linked up. And thanks for pinning! Thanks so much for the feature Jessica! Thanks for the review on this! Something about Sundays always makes me crave CFA. :) Thanks so much for linking this up to Monday Funday! Oh ya, grabbing the recipe for the once in a blue moon craving. Thanks for sharing & linking up @ DearCreatives.com Have a great week! This is so great. I love their sandwiches but I read an article the other day about all the added chemicals in the real chik-fila....yuck! I'm so making this at home! 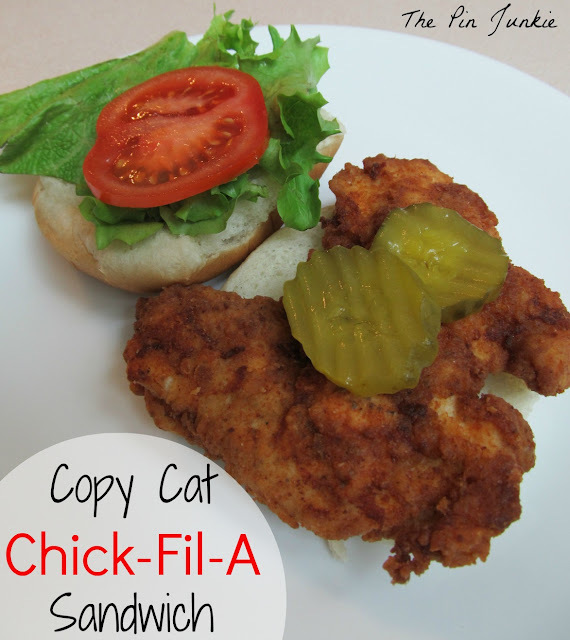 I LOVE Chick-Fil-A....This caught my eye on last week's link party, so I featured it this week. I hope you will come by The Patriotic Pam today and check it out. (http://www.thepatrioticpam.com/2013/03/wowza-weekend-link-party-6.html) Your photos definitely caught my eye! Can't wait to try this recipe. You just made my day! Thanks for the feature Shauna! Chik Fil A is one of the things I miss most about America! I wish they'd just expand and become an international restaurant! Thank you so much for linking up with me this week at Tasty Tuesdays! I’ve pinned this & shared it with my followers! Please be sure to stop back by tomorrow & link up your best “man food” recipes in honor of Father’s Day! Thanks Anyonita! Sounds like fun. I'll be there! Thanks for sharing at the Burger Bash! Great recipe. 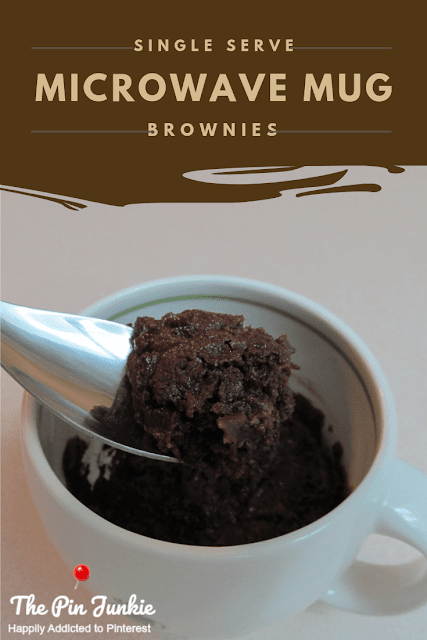 I made these tonight and they were so great! Thank you! Chick-Fil-A chicken sandwiches are one of my favorites! Glad you liked the recipe!